Black metal is many things, and one of them comes from Poland in the name of Luna Ad Noctum, who are now releasing their fourth album, Hypnotic Inferno. A small album of 9 songs with most focus on heavy drums, but unfortunately much of their music is a bit noisy and not so serious that their fans could expect. Luna Ad Noctum have enough experience to make good things, but as I see it there is a limited cup of goodies. In Hypnosis is very hard, speedy and classy black metal. Quickly moving on to Fear Tecnique that brings a deep interesting rhythm to us, and simply earsplitting vocals which makes their unique mark. Fleshless fights the world with aggressive guitars and a black attitude not to be messed with. 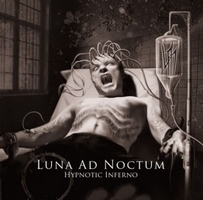 Luna Ad Noctum is a fine band, but this time they have not made their best of albums.